Papers given at a CBA conference held at Cardiff, January 3-5, 1969, are introduced by Joseph Raftery, who outlines the problems needing research (pp 1-10). 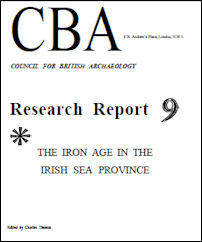 In Ireland the chief priority is to find habitations and burials to provide a context for the isolated metalwork finds. There is so far no fixed chronological point, but a rough sequence appears thus: c 200 BC a transitional period, still LBA in essentials; then native production of La Tène style bronzes to c AD 0; then a romanising period of unknown length. For Wales, with its apparently non-native metalwork, the submission is that EIA evidence is even more tenuous. Welsh-Irish contacts were intermittent and small-scale, and the Irish Sea traffic was north-south rather than west-east.